A nightshirt is a great alternative if you've grown tired of your lounge pants or need a break from beat up boxers. Emanating a distinguished presence that is both attractive and unique, sleep shirts are suitable for sleeping, lounging and kicking back in style. There is a wide variety of nightshirt options making them ideal for men of all ages and sizes. Classic flannel nightshirts are comfortable and cozy and are perfect for wearing on a cold winter night. These nightshirts are reminiscent of garments worn in the past and are loved by all generations. Scandia Woods Flannel Nightshirt: From Blair, this pullover, v-neck nightshirt features a three-button placket, chest pocket, and stylish shirt tail hemline. It is priced under $30 and available in sizes XL/2X to 3X/4X. Color choices include Blue Plaid, Multi Plaid and Gray Plaid. Soft Flannel Nightshirt: From Wittmann Textiles Company, this nightshirt is done in a soft, classic flannel. It features a three button front, left chest pocket and full cut sizing. This shirt comes in plaid colors such as Royal Blue, Navy, Blackwatch, and Stewart Red. It is priced under $40 and comes in sizes small to XXL. Keep in mind that there is an additional $2 fee for XXL. Portuguese Flannel Nightshirt: From the Vermont Country Store, this nightshirt is priced around $50. It is done in a thick Portuguese flannel and features a button-front placket and check pocket. This traditional style is available in a variety of plaids including black, charcoal and denim as well as solid colors in blue, green and gray. Sizes include medium to 3X. Cotton is the ideal choice for a nightshirt since it will keep you cool on a warm night. Cotton nightshirts are lightweight and comfortable and are often done in a blend of cotton and polyester. 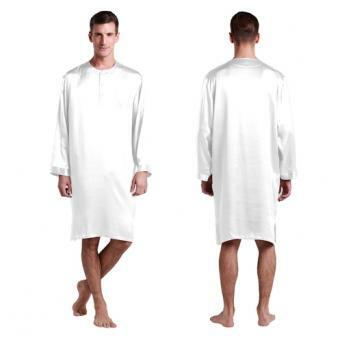 Broadcloth Nightshirt: This v-neck nightshirt is done in a soft cotton/polyester blend. It has a button placket and a chest pocket and comes in colors such as Blue Stripe, Navy Plaid, Navy Pinstripe and Light Blue Plaid. Sizes available for this style include M/L, XL/2X and 3X/4X. This nightshirt is available at Blair and priced around $30. John Blair Jersey Knit Nightshirt: Also from Blair, this nightshirt is done in a pullover, henley style with a three button placket. It is made from the same cotton jersey fabric as a t-shirt making it super soft and breathable. Features include side vents and a shirttail hemline making it comfortable and easy to move in. Colors available include Burgundy Heather, Charcoal Heather and Indigo Heather. It is priced around $30. Summer Light Cotton Nightshirt: This lightweight nightshirt is done in 100 percent cotton. It has no seams or tags, making it very comfortable. Color options include Navy, Crimson and Medium Blue. This style is done in a generous width for added comfort and is available in sizes medium to XXXL. It's available from Wittmann Textiles and priced around $25. You can find nightshirts in a range of other fabrics. For example, a silk nightshirt is a luxurious option for the man with great taste and style. 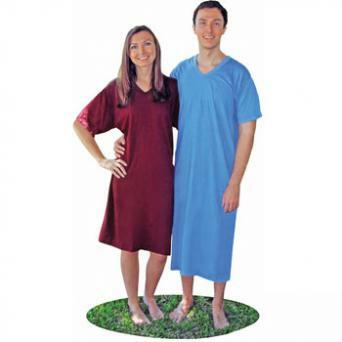 Fleece nightshirts provide added warmth and are great on cold nights, while linen nightshirts are an option to consider on a night that you want keep cooler. Momme Silk Nightshirt: From LilySilk, this pullover nightshirt has a simple round neckline and features long sleeves with banded cuffs. It is made from 100 percent silk and is lightly brushed for added comfort and luxury. Priced around $190, it comes in White, Dark Gray, Claret Red, Navy Blue, Black and Violet. It is available in sizes 34/XS to 48/XXXL. You can customize the size of the garment for an extra $30. Artic Bear Fleece Nightshirt: This cozy nightshirt, found at Haband, is priced under $25 and comes in sizes small to 6X. It features a roomy cut and is available in Black, Navy, Grey, Royal Blue, Green and Wine. It's made from a machine-washable polyester fleece that will not pill or shrink after being washed. 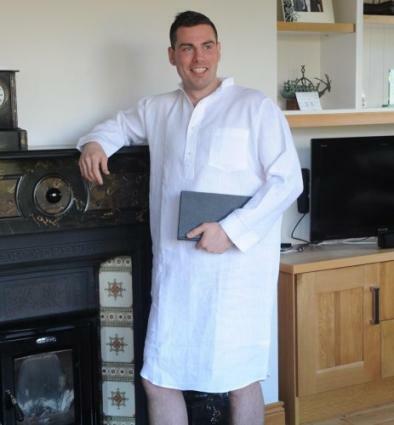 Irish Linen Nightshirt: From Murphy of Ireland, this linen nightshirt is made from a single weave Irish linen. It is priced around $120 and ships for free worldwide. This nightshirt is done in crisp snowdrop white linen and comes in sizes small to XXXLarge. It is designed to be longer in the back and features a four button placket neckline making it easy to get off and on. Whether you are purchasing a nightshirt for yourself or for someone special, there are a few tips to consider. Since this may be the first nightshirt you (or he) will own, you will want it to fit comfortably and look great. Sizing: Most nightshirts run true to size and it's better to have it a bit roomy than snug. If the wearer is in between two sizes, go with the larger size. Style: You can never go wrong with a classic style. 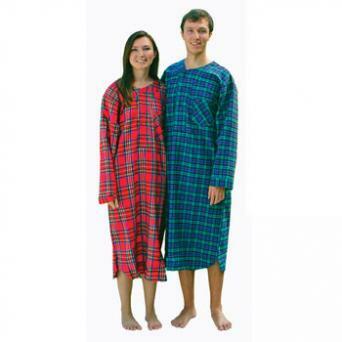 Men of all ages are sure to appreciate a traditional flannel nightshirt that will be warm and cozy. For someone a bit more daring, consider a bold color or pattern, or an uncommon fabric like silk or linen. Budget: Nightshirts can be found in a range of prices depending on fabric and brand. If this will be the first nightshirt owned, go with a more inexpensive option to see if the look and feel are suitable. Sleep shirts are a unique and practical gift to buy the man who has everything. With several styles, fabrics and patterns to choose from, nightshirts can satisfy the most discriminating of tastes. For those men ready to experience the freedom of unconfined comfort, now is the time to consider adding a nightshirt to any evening wear collection.